The Barn sleeps 6 and includes hot tub and infrared sauna use at the on site spa facility. 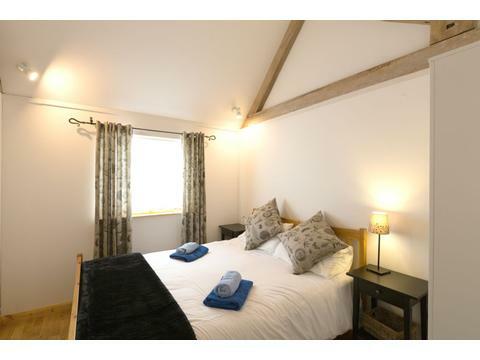 A beautiful barn conversion, with a king-size ensuite bedroom, twin bedroom and family bathroom on the ground floor. There is a double mezzanine bedroom upstairs and own enclosed patio area with barbecue. Visit Britain 4 star rated. Flat screen TV and dvd player, WiFi throughout, fully equipped kitchen with dishwasher, microwave, electric oven, ceramic hob and everything you need for your self-catering break. Beds are made for arrival and towels included. 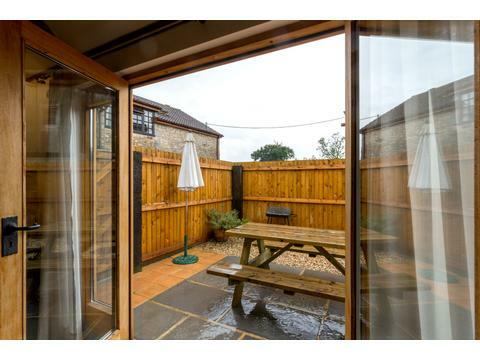 Located in central Somerset, an ideal location for visiting Lyme Regis, Charmouth, Glastonbury, Wells. On a working farm, with cows and their calves grazing peacefully in the surrounding fields. Walks to country pubs and restaurants, the East Deane Way, a walk that extends right across Somerset, runs right through the farm. An ideal base for a cycling holiday. On site options to pre book include spa pampering, Murder Mystery evening, clay pigeon shooting, catering. Located 10 minutes from Taunton near the villages of Hatch Beauchamp and Wrantage. Easily accessible from the M5 J25, only 5 minutes. Train from London 2 hrs, Bristol 1 hrs, Exeter, 40 minutes and Bath 1.5 hrs. Glastonbury and Wells only 40 minutes. Contact Elizabeth Bray for Enquiries and Availability.